Erik is a versatile actor with a growing resume of voice work in video games, commercials, and on screen work in movies, shorts, and TV shows. Featured in video games like League of Legends, Assassin's Creed DS, The Walking Dead: The Game - Season 2, Sim City & More. For more about what Erik's done, check out his IMDB profile! Cue the Horns from the marauding raiders! 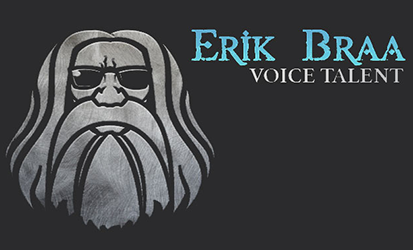 Erik is the #VikingofVoice...well, he is a Viking for anything really. He got his start in video games and has garnered success in all areas of acting. Most well-known as the voice of "Draven", "Jax", and "VelKoz" in League of Legends. He has lent his voice to hundreds of games, from Heroes of the Storm and many Blizzard titles, to The Walking Dead game for Telltale Games. You can hear him doing Audiobooks like "White Tiger Legend" and Stories like "TransSiberian Railroad" in the Calm app, as well as Commercials and Promos. Pillaging SoundBooths everywhere, here comes the Viking! The Viking of Voiceover! I Almost Got Away With It - Season 1 - Episode "GOT to go to Canada"
Erik is represented by Stars Agency — they can be reached at 415-421-6272. © Erik Braa, 2017—2019. All rights reserved.